One very common concern among aging women has always been wrinkles. Most women concentrate so much on the cheeks, eyes, neck and mouth that they forget a part of the body that is frequently exposed and as vulnerable to wrinkles like any other part of the body – the chest and the cleavage. If you notice the trends on women fashion nowadays, they all try to highlight this area. For this reason, many aging women wanted to rejuvenate wrinkly cleavage and chest. It’s not surprising that cleavage and chest wrinkles form the same way fine lines and wrinkles on other parts of the body do. The chest is an often exposed area and many women forget to use generous amount of sunscreen on this area, resulting to sun damage. Also, natural aging process causes thinning of the skin, as well as decrease in the production of protein and collage. With less collagen, there is less elasticity under the skin to support this body areas. In the case of women, cleavage wrinkles form due to the weight of the breast pulling the chest skin down. Another reason why chest and cleavage wrinkles develop is due to breast surgeries. Women who undergo radiation treatments for breast cancer may notice changes in the texture of their chest skin. Fillers. Filler can fill in wrinkles and deeper lines by injecting hyaluronic acid, fat or collagen under the skin. Similar to Wrinkle reduction treatment , it is often used for facial imperfections and volume loss, but in the case of cleavage or chest wrinkles, it can help diminish wrinkles on the chest and cleavage area. Fillers can be a great alternative from chemical or device-based procedures like laser resurfacing, chemical peels and many others. Botulinum toxin. Though Wrinkle reduction treatment is usually administered for facial wrinkles and fine lines, it may help lessen the appearance of chest/cleavage wrinkles. Wrinkle reduction treatment works by relaxing the muscles and inhibiting contractions. Wrinkle reduction treatment can give you a smoother cleavage and chest skin that could last between three to four months. With Wrinkle reduction treatment , the cleavage line will be much sharper and more defined since you’re not seeing any fine lines anymore. The fine lines will disappear after about 24 hours post-injection. Chest and cleavage rejuvenation using Wrinkle reduction treatment will need about 10 to 20 injections. 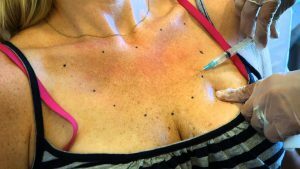 Though Wrinkle reduction Injectionis not FDA-approved for treat chest area wrinkles, it is one of the many off-label uses of Wrinkle reduction treatment . Clearly, the first step to prevent further wrinkles on your cleavage and chest is to use sunscreen every day. Anytime you expect to go outside, you have to apply sunscreen to skin areas that are exposed to the sun. You may think that a cold or cloudy day will not cause any sun damage; in reality, ultraviolet rays during the day are always present and must be treated accordingly. If you are a heavy drinker or a smoker, it is best to take both in limited quantities. When it comes to minimally-invasive cosmetic medicine, Wrinkle reduction treatment is the leading treatment drug for countering the effects of premature aging and preserving youthful skin. Aside from treating wrinkles in the forehead, it can be skilfully administered to treat wrinkles in the lower face, neck and around the mouth. It has been used since 1970’s and until now, Wrinkle reduction treatment has been shown to have consistent excellent safety record. If you want to erase the appearance of any wrinkles or lines and have a smooth, flawless complexion, Wrinkle reduction treatment is definitely for you. Tested and proven to lift brow – your eyebrow may lower or drop over time. With Wrinkle reduction treatment , it can actually lift and shape them, making you appear less tired and give you a radiant look. Though the shape of each person’s brows is different, Wrinkle reduction treatment can help create a natural-looking shapely brow. Minimally invasive treatment to dynamic wrinkles and lines – you can achieve a flawless, youthful complexion without any cuts and wounds. Safe and effective anti-aging treatment – The skin recovers in a relaxed, tension-free environment. With the help of Wrinkle reduction treatment , your facial muscles relax resulting in a significant reduction of wrinkles and lines. To enjoy the best results of Wrinkle reduction treatment , it is important to take these measure before, during and after the treatment. When it comes to Wrinkle reduction treatment , there’s no such thing as overdone, only mis-done. Certain lifestyle factors and age should be considered when deciding which facial areas need Wrinkle reduction treatment injection. When done in perfect balance, it is almost impossible to see that Wrinkle reduction treatment was injected. The quantity of Wrinkle reduction treatment is also very crucial. Administering enough product will make sure that it lasts longer. Don’t touch it. And skip the gym for now. On the day after Wrinkle reduction treatment , don’t exercise. Excessive movement may cause the product to move away from the injection site. In addition, avoid massaging your face, placing your head down over your arms or touching it, if possible. Never sleep face down on a pillow. Avoid touching your skin where the Wrinkle reduction treatment was administered. Never massage or rub the injection site for 24 hours. If possible, avoid pain reliever particularly Ibuprofen (Advil, Motrin), Naproxen sodium and Aspirin as they have blood-thinning effect and hence, increases the risk of bruising. Tylenol (Acetaminophen) is fine. If you experience bruising, proper hydration and nutrition are necessary for fast healing and recovery. Eat foods rich in Vitamin K such as cruciferous vegetables (cabbage, broccoli, kale, spinach) and Bromelain (pineapple) to help in your skin’s healing. Furthermore, drink lots of water and avoid consumption of alcohol as it can lead to dehydration.